Our experienced and highly trained veterinary surgeon is well qualified to provide the best and most appropriate care for your pet. If your pet needs a surgical procedure that we do not offer, we are able to refer you to an appropriate specialist. We carefully and safely place your pet under anesthesia. Our monitoring system allows us to track heart rate, respiratory rate, blood pressure, and oxygen level. 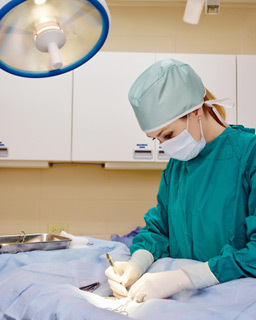 We closely monitor your pet before, during, and after the surgery. We also take pride in keeping your pet comfortable and keeping pain minimal, as well as making sure the owner is well informed about at-home care to insure your pet has a safe and speedy recovery. Communication is key! We want our clients to feel comfortable in knowing we will keep them informed on what is being done and what will need to be done in the future. We will be here for you to explain procedures, treatments, and answer questions. Bottom line is we are here for you!